Kelly Linehan joined the morning show gang in 2018 as co-host and producer for CTV Morning Live. Kelly is already well-known to CTV viewers. She came to CTV Atlantic in 2015 as a reporter before covering a maternity leave hosting CTV News at 5. Kelly has wanted to work in television since she was seven years old. She pursued her career path by studying journalism at Ryerson University. After finishing her degree, she took her first broadcast job in B.C. She was the only person in the news department at the local radio station in Campbell River. Then in 2012 she joined the Bell Media team anchoring the news on CFAX 1070 radio in Victoria. In 2013, the opportunity arose to make the move to television. 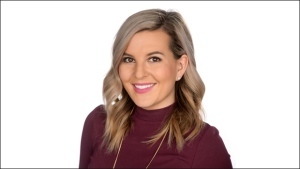 Kelly joined CKPG in Prince George as a video journalist, but was also given the chance to report, present the weather, as well as anchor the news and sports. She started her trek eastward when she accepted a position on CTV Morning Live in Winnipeg, and there was no looking back. Kelly is at ease talking about news of the day, what’s for dinner, what’s trending online, and everything in between. She has covered crime, politics, sports, business, and human interest stories. She has interviewed notables like Sidney Crosby, Guy LaFleur, Prime Minister Justin Trudeau, Amanda Lindhout, and k.d. lang. In her time off, Kelly likes to read, travel the Maritimes with friends, and cook badly. In fact, she’s even been known to host the odd “Taco Tuesday” at her place.